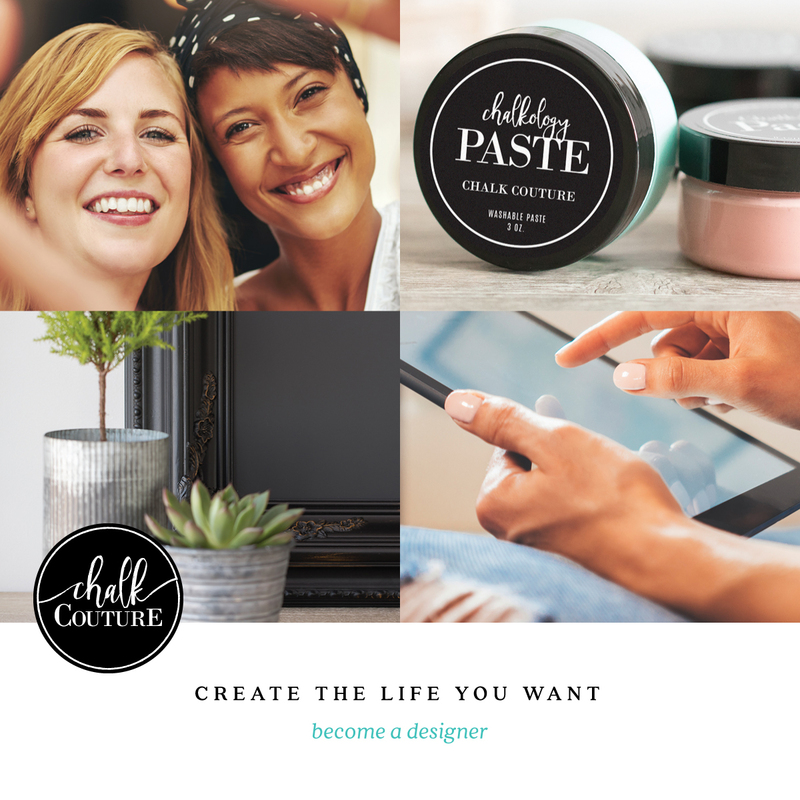 You've decided Chalk Couture is for you and that is so exciting! 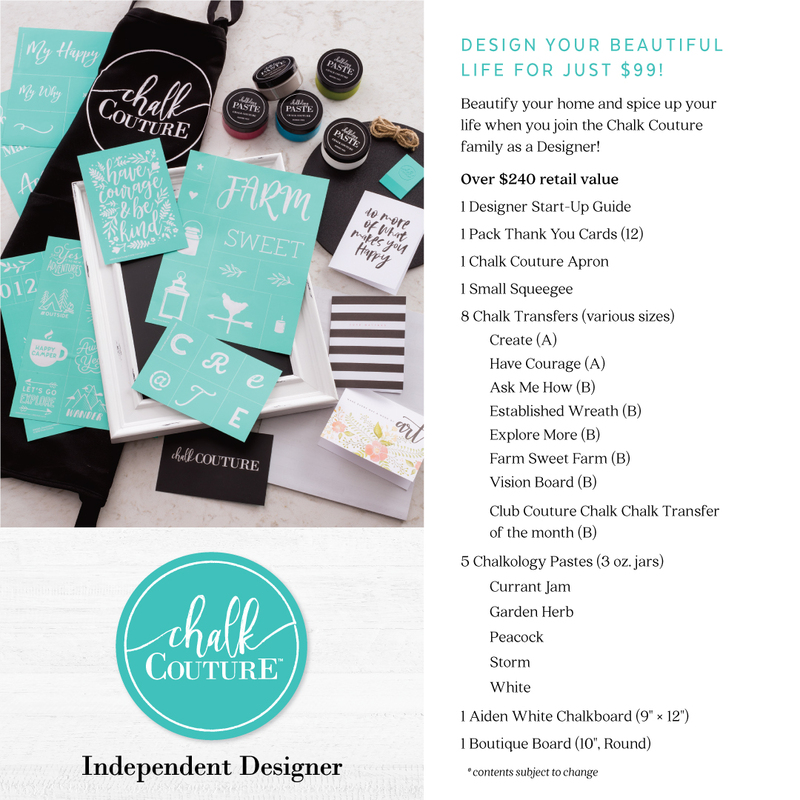 Here is all the sign up information and requirements you can expect as an Independent Chalk Couture Designer. If you don't need any further info, you can go straight to Enrollment Here. Otherwise, continue reading! Initial Cost: Your starter kit costs $99 plus tax and shipping. The value of the kit is over $240! During your sign up you will choose a name for your replicated website. This is where you will direct your customers to make purchases. When a customer purchases directly from your website, you receive a 25% commission. This is paid out to you the following month via direct deposit. Cost of Website: Your sign up month is free after that the cost is $19.99/month. This is billed as a subscription and with your subscription, Chalk Couture sends the Club Couture transfer to you. This is included in that $19.99 fee and the retail value of the transfer is $14.99. We receive it a month before release and can use it to promote Create-n-Takes, bundles, etc. This is a wonderful incentive to us designers. Additional Commission: As a designer we receive a 40% discount on products. 40% is almost unheard of in the direct sales industry. Once, you sell your inventory to the customer, it is a 40% delayed commission. Basically, you get to keep that difference at the point of sale. Incentives: In addition to the very generous commissions we receive product credit, called Designer Dollars (DD). This is earned starting at a Personal Volume or PV (products we purchase or sell) of $200 and increments $200 there on after. So for instance, you have a PV of $200= earned $20 DD, $400=$40DD and on. There are also additional money bonus once you hit $2000.00 in sales. Support and Training: There is no shortage of training! It's just a matter of finding the time to watch and learn all of it! When you join The Chalkalicous Charmers team, you have the full range of resources Chalk Couture provides. As part of my team you will also have access to my incredible up-line of sponsors. We are talking support, incentives, videos that you can use and so much more. I have found so much encouragement, inspiration and friendships from this team. Once you join, I will add you to all the amazing Facebook pages: my two uplines, Chalk Couture's Active Designer page and I will recommend additional team Facebook resources, such as Mock Parties, Opportunity pages and more. Requirements to stay active: $150/quarter is what is needed for you to remain an active Independent designer. Getting Started Incentives: Designer Debut is an awesome way to boost your business and earn even more Designer Dollars. In a nutshell, Designer Debut period is your sign up month plus 3 additional months. There are 3 phases and thankfully the back office helps keeps you informed of your progress. Phase 1- Sign up month and first full month reach a PV of $600.00 receive $60 DD. Phase 2- second full month reach a PV of $800 in that month receive $80.00. Phase 3- third full month reach $1000 and receive $100 DD. As a bonus if you complete all three phases or reach a PV of $2400 during that time frame, you will receive an additional $240 DD for a total of $480.00 DD. Remember this is on top of the DD's you receive for hitting that incremental $200 PV. 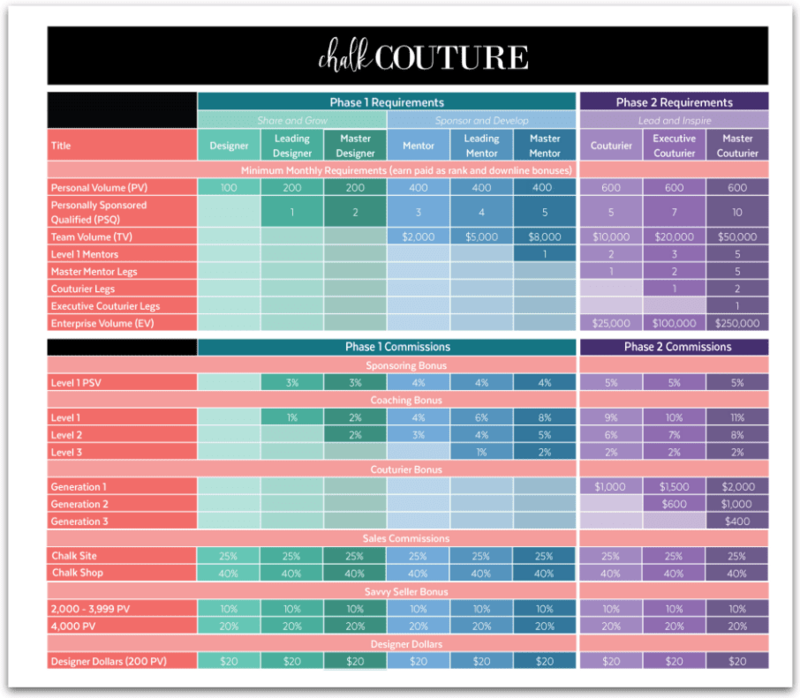 Compensation Plan: Chalk Couture has structured a generous compensation plan as you build your team. I just want to have fun: Chalk Couture is fun whether you are trying to build a team or you just want to be a hobbiest! You are welcome, which ever direction you want to go. So, that is Chalk Couture in a nutshell! Now, it's time to Enroll as an Independent Chalk Couture Designer! If you need any further info. You can contact me through the contact form on the right or find me on Facebook (just click on links). Once I see your enrollment information, you will receive a welcome email from me. Once that connection is made, I can then add you to the amazing team groups (mentioned above). I look forward to taking on the Chalk Revolution with you!